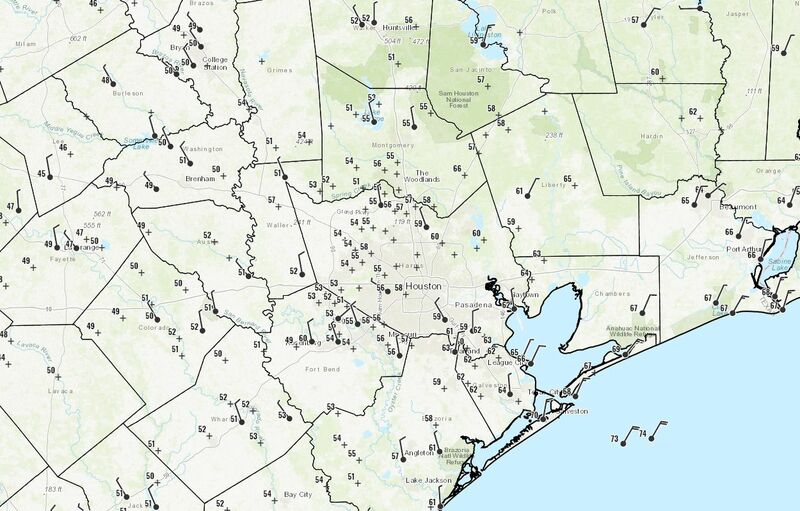 Temperatures are generally 20 to 25 degrees cooler this morning across the Houston metro area, with lows in the upper 40s for far inland areas near College Station, in the 50s for most of Houston itself, and the lower 60s along the coast. After the influx of colder air, what you see with our weather now is basically going to be what you get. We’re probably stuck with mostly to completely cloudy skies for the rest of this week, and we may see some periodic stormy activity like we saw on Monday. This will be the region’s coldest day in at least six months, with cloudy skies and high temperatures generally in the low 60s for Houston, and 50s for some inland counties well away from the coast. Rain chances will not be too high today, I’d peg them at around 30 percent, with heavier showers likely remaining well to the north of the area, or offshore. All in all, this will be a rather dreary day. (Until the Astros win this evening, of course). Not much changes for the middle part of this week, with a cooler air mass near the surface, and warmer above, allowing for a thick cloud deck and continued moderate rain chances. All told, I’d expect most of the area to pick up about one-half inch—totals will be highly dependent upon very localized storms—of rain over the next three days. High temperatures will warm into the upper 60s and low 70s for the region. Models continue to hint at elevated rain chances on Friday, with ample moisture moving into the atmosphere. 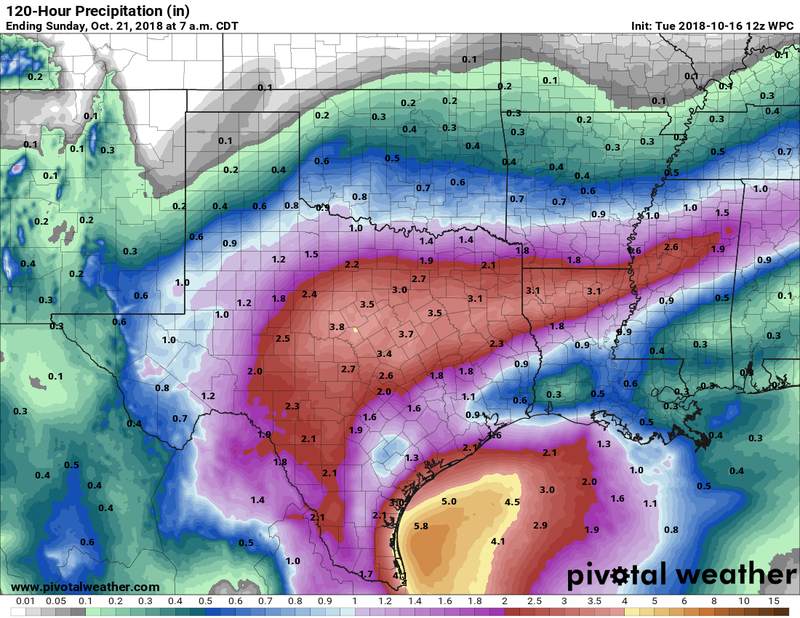 For now, the heavier totals toward the end of the week seem more likely north of Houston, in the vicinity of College Station or Huntsville, rather than the city of Houston itself. However, it’s too early to have much confidence in details. Either way, look for a muggy, gray, and damp day Friday with highs in the mid-70s. The forecast for the weekend is still muddled, but our best guess is for gray skies on Saturday with highs in the 70s. A cold front is likely to come through sometime on Saturday, Saturday night, or Sunday, and that will determine our weather for the second half of the weekend. Right now I think there’s a decent chance it comes far enough through to allow for some partly to even mostly sunny skies on Sunday, with highs around 70 degrees. But that’s not a promise, sadly. It looks like this gray, cooler, and on-and-off wet pattern will continue for most of next week. You’d be forgiven if you thought you lived in Seattle—that is until you pay your rent or check your mortgage. The median home price there is about $840,000, compared to around $240,000 in Houston. “It looks like this gray, cooler, and on-and-off wet pattern will continue for most of next week.” Ahhhhhhhhhhhhhhhhh. The pause that refreshes! I’m from the Seattle area, been here 2 years now; it’s an expensive place to live but it’s beautiful. Agree on the beauty of the PacNW. Beats the pancake bleakness of SE TX. I remember my first trip to the area on what happened to be the Summer solstice. It was on business in Everett and I didn’t have anything to do until the next day. So, I ended up walking around an outdoors mall enjoying the 80 degree, breezy, sunny weather. It was so nice compared to June in Houston I couldn’t get enough of it. You can’t eat the scenery, Colorado is getting to be the same. You can’t eat the scenery, Colorado is getting just as bad. As someone that live in Galveston. I hope all the mosquitos die. I hope they all die cold, miserable deaths. Don’t go broadcasting our low housing costs, we don’t want people swarming here and driving them up! Wow this is miserable, but nobody is out and about, so the short part of my commute that is on the Bayou Greenway Trail lets me have the trail to myself. 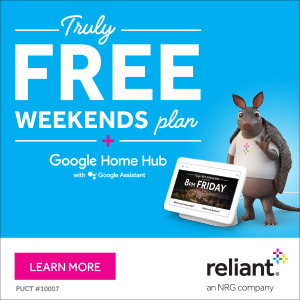 Houston is like a ghost town. Much as the people cry about the hot weather, when it gets a little cool, they disappear. I LOVED running in this weather this morning! I could actually breathe, didn’t feel like I was going to die of a heat stroke, and beat my best 1 mile time without even trying! Love it! We all PR during the first few days of cooler weather. It’s something I look forward to every year! I wish the cooler temperatures would nudge a little east. Weird how the coldest air went straight south and west with Brownsville being colder than most of the Houston area.